This old fishing boat, berthed at Carloway pier, awaits the breakers yard, probably too unsafe to put to sea again. I kept returning to this boat as I love the shape of a boatʼs hull out of water. The light this day was dramatic with dark storm cloulds and bright light hitting the boat, lighting up the hull and rusty wheelhouse. 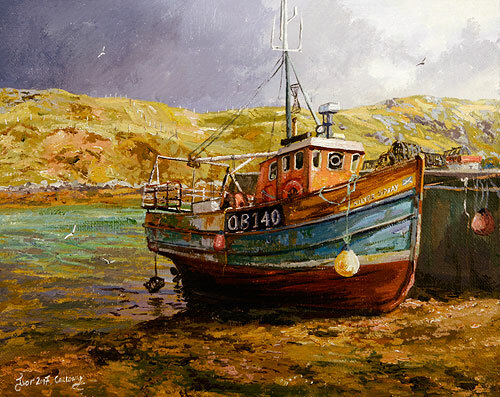 For me as an artist this Oban-registered boat was fantastic as subject matter. Carloway is a village of rolling hills and quiet glens and also boasts the restored blackhouse village at Garenin.